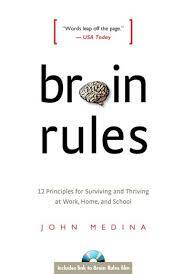 Neuroscience Meets Common Sense With These 12 Principles To Help Babies, Children And Adults Thrive from John Medina’s Brain Rules. 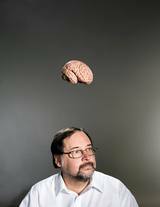 Developmental molecular biologist John Medina rocks! His research into and deep understanding about how brains develop led him to write one of the best books I’ve ever read on human development. Common sense intersects with good science to create the following 12 principles. Watch a video on the book here. Parents, educators and entrepreneurs will all benefit from this excellent advise. 1. The human brain evolved to solve problems, related to survival, in an outdoor setting, in almost constant motion. It’s not wired to thrive when people are stuck at a desk doing rout work for long periods of time or leading the life of a couch potato. 2. Exercise boosts brain power. Kids need recess/exercise at least twice per day. Employers should encourage use of excise equipment – like bikes and treadmills – during the work da y. Adults who get aerobic exercise as seldom as twice per week reduce their risk of Alzheimer’s by 60%. 3. Sleep well, think well. Good sleep is fundamental to good learning and maximum thinking power. All humans function best when they take a short nap too. 4. Brains suffering chronic stress don’t learn well.Emotional stress has huge impact on society – it affects children’s ability to learn and adults productivity at work. A little stress is good; our bodies respond to it by releasing cortisol and adrenaline. But chronic stress – like ongoing problems at home, school, work – damage brain function. Society benefits enormously by encouraging/teaching parents, schools and employers to deal with emotional problems that create long-term stress. 5. All brains are all wired differently and this wiring changes as we continue to learn. Nurture lifelong learners. Encourage development of multiple intelligences; don’t just teach to IQ tests and reading & writing scores. Customize workplaces to draw on employees strengths too. 6. Humans don’t pay attention to boring things and ten minutes is the average maximum time we can pay attention to any one point. Emotions always capture our attention. In presentations, bait the emotional hook every 10 minutes by referencing something relevant to others. 7. Repetition aids memory, as does a compelling introduction. 8. Brains learn more when multiple senses are stimulated at the same time. But smell has a uniquely powerful way to elicit emotions. 9. Vision tops all senses. It uses ½ of our brainresources. A picture really is worth 1000 words. Communicate with pictures more than words. Use animation and video. Movement and color particularly capture our attention. 10. Study or listen to music to boost brain power from infancy through older adulthood. It improves language skills, listening skills, social skills. It teaches us to better detect emotions and be more empathetic. 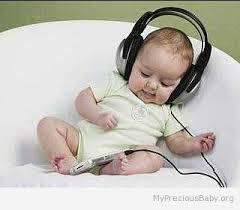 Even infants become more social with music training (Thank God I took my kids to all those Mommy & Me Music classes!). Also, it makes us happier, because when we hear music that we enjoy, our brain releases dopamine, cortisone and oxytocin. Music therapy works wonders too. 11. Male and female brains are structurally, biochemically and genetically different. X (female) chromosomes have 1500 genes which include the control of cognitive brain function. Y chromosomes only have 100 genes. They respond to acute stress differently. Women activate the left hemisphere’s amygdala and remember the emotional details of stress; men activate the right hemisphere’s amygdala and remember the gist. Schools should teach to those differences and employers should organizers workers into teams that will maximize the strengths caused by those differences. 12. Humans are powerful and natural explorers. Babies aren’t a blank slate mentally, as was originally believed. They are powerful exploration and learning machines – the model of how humans learn their entire lives. Some parts of our brains stay as malleable as a baby so that we can create neurons and learn new things throughout our lives. Encourage exploration of every individuals passions. Give employees free time at work to experiment with what interests them. Create more problem solving and exploration opportunities at schools too. Purchase this e-book on KOBO and benefit your local book store here.